I had a particularly lively and curious set of classmates in Jo Miller’s Journeyman class. We frequently ranted that in the 150+ years of local beekeeping, not only has no one come up with a general template of how to run local bee colonies, but many basic questions remain unanswered. Questions to do with the most simple aspects of bee physiology, bee behaviour, and basic management. So I have started this list. Perhaps against the day I get back on the academic treadmill and need an MSc. topic of my own. Meanwhile, you little bee scholars you, if you take up one of these topics let me know what you find. We’d all be interested, and grateful. There is still no consensus on how and when winter bees are created. Are they raised in late summer? Early fall? Winter? Are they raised differently, fed some special diet as larvae? Or do late summer adult bees just shift their physiology based on environmental cues (waning sunlight? pollen dearth? dropping temperatures? reduced brood amounts?). If, as I did in 2017, you plunder big colonies for bees and brood to give to newly mated queens, do you thereby plunder all the winter bees out of the hive, dooming the original colony to a winter death? Or will they raise another crop of winter bees? How long would that take? In spite of the fact our local winter weather (gloom and torrential rains Nov-April = 6 months), there is no consensus on what method of wrapping is best for our bees. Some use tarpaper, some bee cozies, I experimented with Reflectix this year, do you keep the summertime upper entrance or not, put on emergency rations, and/or insulation over the cluster? You will hear a bunch of “recipes” and while microclimate comes into this, what is the best way to wrap particularly if your site is less than ideal?? There have been some interesting observations on the whole art of feeding pollen sub. One study suggested winter bee raising is cued by a fall pollen dearth…so should you remove all pollen sub before September? If you are building small, late summer colonies (as I was in 2017, thanks to a late and surprise queen rearing run), does feeding them up with pollen sub to push brooding ruin their winter prep? Randy Oliver feels pollen sub helps in the short run but hurts the colonies in the long run…he speculates that pollen sub has a missing mystery Factor X. Or does it have something already in it that slowly affects the colony over time, sapping vigour (like a constant hangover effect)?? We’d all like to know. People like to add all kinds of things to their cane sugar syrup, which in our biozone is an essential feed in the long dearths we have in early spring and late summer. I have heard of people adding Rooster Booster, thymol crystals (my bees would not touch THAT syrup! ), essential oils, Honey B Healthy, etc. ad infinitum. My own sense is that they do best on straight white sugar syrup. Do floral nectars have anything in them past sugar and water that the bees need? Some small suite of micronutrients? Or do they get all they need from the pollens they collect? What hive design and/or box config is best for bees? This year our club is experimenting with the single box broodnest approach used by the University of Guelph. Some of our members are trying horizontal hives of all sorts, and Warré hives (note: not only are Warré hives illegal in Canada as their frames are not removable for disease monitoring, they are a PITA!!! I have been helping a local beekeeper with one for several years…my advice is run in the opposite direction!). Are the larger frames and larger boxes like the British National hives better for bees and/or beekeeper? Which config best supports increased vigour and honey harvests?? I have been keeping bees now for eight years. In spite of taking courses, reading every book I could, keeping my eyes and ears open, and earning my Master Beekeeper designation, I have made every mistake I could. Sometimes I needed to make those mistakes more than once! And I know more are out there waiting for me to make. Such is beekeeping. What is your motivation? If you want to learn about bees and their way of bee-ing, and have honey to give away at Christmas, learn to keep bees healthy via a thoughtful program of feeding and mite control when necessary. If you want to troll through hive after hive of sick and dying bees, searching for that elusive Varroa-proof bee, check out the treatment-free approach. I have decided I do not like dealing with crashing colonies, so I deliberately left the treatment free camp early in my beekeeping career to just enjoy raising bees. There are talented researchers now systematically looking into whether bees can be bred to be Varroa-proof. I will be happy to buy their bees if and when they succeed! Beekeeping is expensive: it seems unfair that keeping honey bees, who used to keep themselves in hollow trees, is so expensive. But you will need to budget for nearly $700 for your first year if you aspire to one hive. More for two. In your first year you are acquiring bees ($220 per pop), equipment (full setup plus spare boxes and frames= $250), gear ($200+). You need to assemble and paint things. You will need to buy sugar for feed, pollen substitute to get your package going, medicines. It just costs a lot of money, so you need a healthy bee budget, and room to keep your spare equipment. It is easy to keep bees, but difficult to keep them well. For the first year or two, you will open that hive, probably with pounding heart and sweaty palms…and not have a clue what you are seeing. That is normal! Just ask a more experienced beekeeper to come look at your hive(s) with you and invite yourself to watch while others beekeep. The more you see, the faster you will learn. Read as much as you can: there is a lot of detail to successful beekeeping so be patient with yourself as you climb that learning curve! Beekeeping is hot, sticky, dirty work. You are out there in the sun, in your bee suit, lifting heavy frames and boxes. There are tricks to avoid lifting full boxes, but beekeeping demands some back, core and hand strength. You will get stung. Style goes out the window! It is worth it….but be aware, your car, your house, your garage will all be filled with sticky, mucky equipment. Listen to all the information, but to quote our Provincial Apiculturalist Dr. Paul van Westendorp: hew to standard practice for a few years before experimenting. I urge you to learn plain vanilla beekeeping in a standard Langstroth setup before you try out treatment free beekeeping, top bar or Warré hives, or any other innovative technique. By running a standard hive in standard ways you will observe the normal arc of development for a bee colony. By developing a sense of what is normal, you will be much better able to evaluate the effect of innovations. The biggest threat to your bees is unchecked Varroa mite infestation. Learn all about Varroa and treat in a timely fashion, at least with the organic acids. Here is another Varroa resource. Inspect every week or 10 days. This builds your sense of what is going on in a colony, and keeps you up to date on what is going on in there. You will spot problems (swarming prep, disease, pests) early…when you can still do something about them. Cultivate mentors. Mentors are often gained when you take a beekeeping course: you can email your teacher(s) questions (preferably with pictures if you have an issue in your hive). Most clubs have a mentor list, or you can ask to have one assigned. Chat boards might turn up an experienced local beekeeper who will give you a hand. Become a gardener! 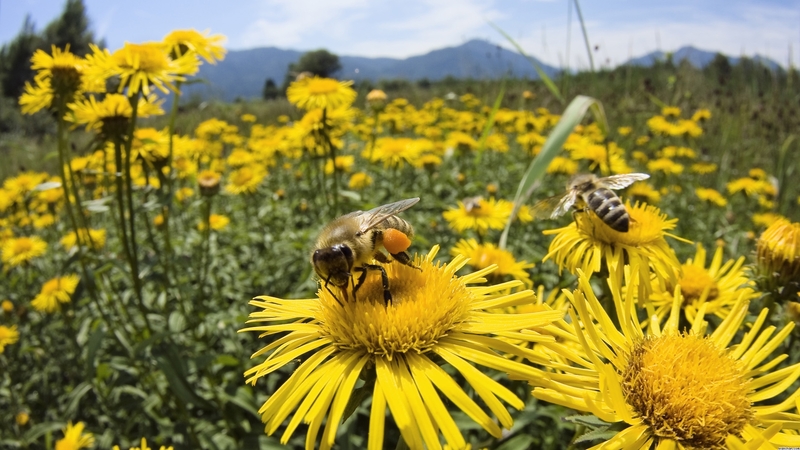 Bees are currently suffering from degradation and dwindling of nectar and pollen sources. The single best thing you can do for honey bees is plant for them. 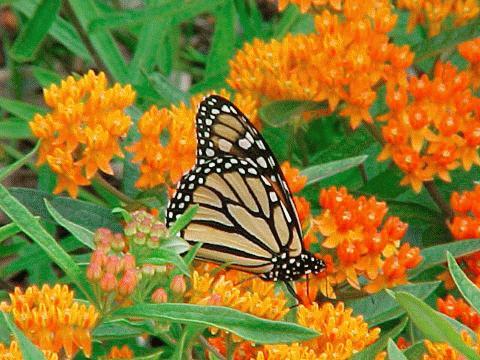 The Xerces Society has excellent information for planting for pollinators. Evaluate your eyesight. It is imperative to be able to reliably see teeny-tiny bee eggs in the cells: their presence or absence is THE critical piece of information you must have each time you inspect a hive. If you are finding you need reading glasses in daily life, you will surely need them to beekeep successfully. Buy some inexpensive magnifiers and keep them with your bee kit. I need to work in full sunlight when I have to find bee eggs, find queens (especially unmarked queens), and evaluate brood health. And be sure to read the very funny but “tells it like it is” warnings on beginning beekeeping from Rusty Burlew. I chuckled at the section on Fashion and the Beekeeper. I too used to tidy up before hitting the grocery store. Now I just wander in after a hard afternoon in the beeyard, hot, sweaty, covered in propolis, my hair scraped unattractively back into a damp pony-tail. The pride…is all on the inside! Check my Resource Page for some beekeeping info! Note if you are about to hive your first package: make sure all the bees are swept from the package into your new hive…if the weather is too cold, the bees will not be able to fly in on their own, following the scent trail made by their sisters in the hive. When it is chilly, just leaning the emptied package against the hive in the hope the bees remaining inside will find home is not enough. Note, you may have to “deconstruct” the shipping hive to get at all the bees inside. Your bee brush will help in persuading the reluctant bees into their new home! Here is excellent advice for new beekeepers, courtesy Southern Oregon Beekeepers. Randy Olivers’ excellent guide to your first year. Rusty Burlew’s Let the Bees Be Bees?? Below are some photos of what your colony should look like in summer. Good fortune, little newbees! May your colonies live long and prosper. Here in the Pacific Northwest, the first spring willows, alders and maples feed the spring colonies, helping them replace the old, work-worn winter bees with new spring bees, who will become the all important summer foragers. The hives must come to strength by early June, when the blackberry blooms, giving us our largest local nectar flow. Without late summer plantings targeted at nectar production in late summer, a time when there is a natural nectar dearth in the best of landscapes, bees struggle. And in an age of large swathes of monocultures, where fields have nothing to offer after the crop spring bloom period is over, and equally large swathes of urban development which are empty of pollen and nectars, all pollinators find it hard to overwinter. They simply starve. Invasives are often the only food out there! Japanese knotweed is now a critical source of late summer/early fall pollinator nutrition. Dandelions provide early spring nectar and pollen. Urban gardens, watered all summer by their gardeners, are often a richer source of bee and pollen nutrition than are the wild places, and certainly more than the cultivated fields. The hives in my urban back yard, surrounded by mature gardens filled with flowering plants, gather more honey than the hives I keep on local farms. Whenever you are out of your depth, stumped, puzzled, or frustrated as a beekeeper, consult some resource persons or sites. Bee clubs often offer mentor programs, and monthly educational presentations. And there is a wealth of information online! First year care of your new colony, thanks to Randy Oliver. A wealth of bee education, here! Wax your plastic foundation for quick comb-building! Good experiment here. Effects of Varroa on the colony. How to conduct an informative post mortem on a dead hive. And… another post on how to do a good post mortem if you have winterkill. How to set your hive up for winter. Excellent winter feed technique that can save your bees. Great blog on making winter candy supplement for your bees. Using Krabby Patties for winter feeding. A good method for prepping plastic foundation such that the bees draw it out immediately. Guide to medications, good info in spite of being advertising! Great general purpose microscope for those who wish to learn to identify their own parasites and diseases. Exhaustive planting list for the coastal Pacific Northwest…don’t forget the the heather, catmint and Rose of Sharon (Hibiscus syriacus)! 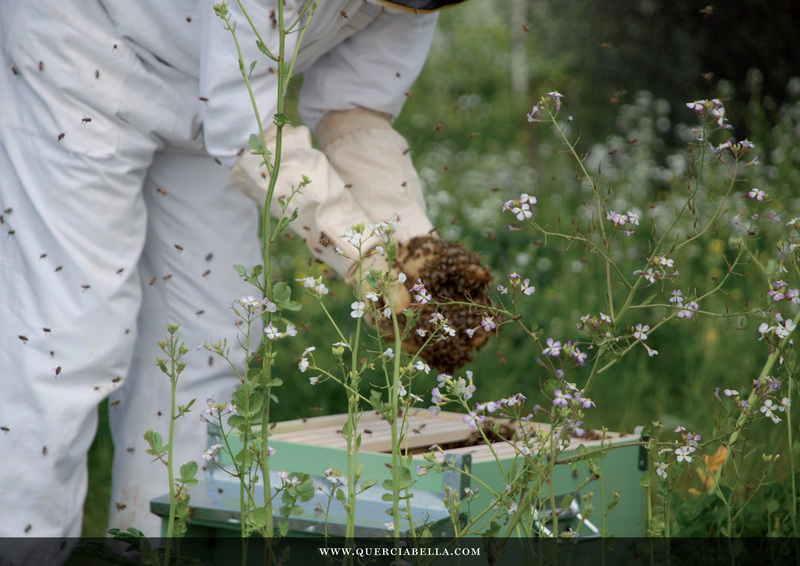 Also for the PacNW, the BC Apiculture calendar of the beekeeping year. The Washington state beekeepers’ forum…great place to get answers to your beekeeping questions. My fave beekeeping videos, from the University of Guelph. I have tried them all, but this beekeeping tool remains a firm favourite…why? Because the pry bar end actually works! The long and shallow angle is invaluable in gentle, easy prying up of sticky frames, and that means your bees are calmer. My favourite feeder, the Rapid Feeder, it is the bomb!!! Linda Tilman’s blog on this feeder, here. My favourite outer cover, the Ultimate Hive Cover. My very favourite bottom board, the durable and brilliant Country Rubes Screened Bottom Board, note it can be adapted to 8 frame boxes: they also have a kickass robbing screen and a small hive beetle refit available. Observation hive! By Greg S. Long of Corvallis, Oregon. Beautiful woodwork. There are so many answers to that simple question. You will be pulled this way and that in your thinking. The treatment free advocates are convinced that if we just raise our bees organically, there will be no bar to colony health. The hive design advocates feel top bar hives and Warré, in which bees are free to draw their own comb as they see fit, will protect bees from diseases and pests via increased natural vigour. Many advocate teas, essential oils, drenches and commercial “natural” preps of all sorts. As we have discussed often, the bees are in trouble because of the Three Horsemen. Of the Bee Apocalypse. But in our highly disrupted landscape, in the face of worldwide spread of Varroa, the constant disease and pest spread via mobile, treatment heavy pollination operations (super pests and diseases now arriving at your municipality!!! ), unsustainable agricultural practices, global warming, pollution, and fear of stinging insects, we as beekeepers must muddle through. We can only do our best. We cannot change the world, at least not quickly. But we can be the best stewards possible to our bees…who in the Pacific Northwest are far, far from their ancestral homeland and need our help to thrive in this rainy, cold, urbanized place we call home. I have often spoken critically of the commercial pollination operations that are treatment heavy and which medicate prophylactically. I have great sympathy for the economic challenges faced by pollination operations and farmers, but I am also aware of the challenges their practices can pose for bees…we can only face facts and beekeep with that in mind. bees need good nutrition. Between October and March, there is no food and little opportunity to fly for it, thanks to the winter rains. Bees must be “put to bed” with lots of stores on board, both honey and pollen, to get them through. Because we can’t help the bees while they are tucked up for winter, leave a sugar brick on the top bars in case, for some reason, the cluster cannot move sideways to get at their honey stores. There is no virtue in letting your bees starve to death. In their home range they enjoy warm temperatures and year long forage. That is not the case here, and never will be. If you are breeding bees, by all means select for thrift in use of winter stores as one attribute of a desirable bee. But if you are not breeding bees, or running a big survivor project, feed the bees you have. bees need to be free from pests, in particular the Varroa destructor mite. 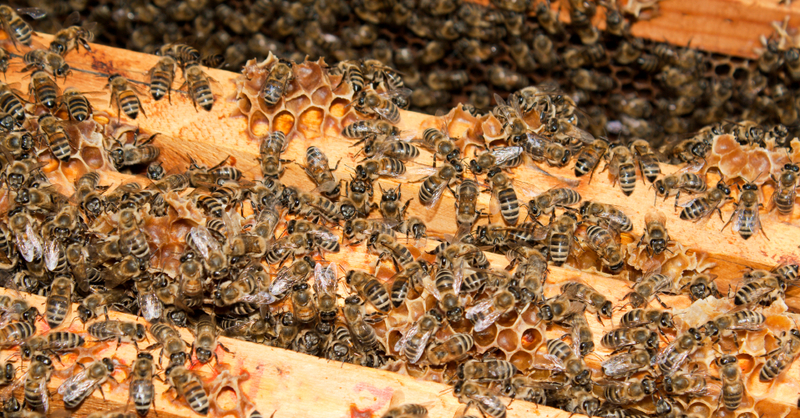 All other pests and diseases pale beside the horrific impact of Varroa on honey bees. Unless you are running a survivor bee project, which must be set up well outside the flight range of other colonies (to prevent drift of pests and disease on bees fleeing crashing hives in your survivor beeyard), then I think you have an ethical duty both to the bees and to nearby colonies to control effectively for Varroa in particular, and tracheal mites in general…and small hive beetle in areas where they are an issue. IMHO and experience, effectively means using at least formic and oxalic acid treatments, probably three times a season. I see no point in letting mite populations build to a point where there is obvious stress and impact on the bees before treating. We can’t, alas, yet aspire to eradicating the mites. But we can give the bees the maximum freedom from predation possible. bees need clean homes, principally clean wax in the brood nest. We are discovering more and more sublethal effects of environmental toxins (pesticides, agrichemicals, urban pollution) on bees. The pollution and chemicals seep into the wax, and the eggs and larvae must develop in the toxic cradle of the contaminated comb. So harvest your comb often, and encourage the bees to draw fresh, clean wax every 2 or 3 years at the outside. It makes for less efficient honey harvests, but we owe it to the bees. bees need winter protection, which here on the coast means winter emergency feed (that sugar brick! ), a quilt box to keep them dry, a rain hat to minimize heat loss, and optional wrapping. I fuss, so I wrap. bees need good forage. Bees are healthiest when they can choose from a wide range of floral nectars and pollens for a balanced diet. Even in urban settings we can replant roofs, byways, lots, medians, gardens and balconies with season long, healthy bee/pollinator forage plants. Farmers, if they won’t go organic, can at least practice bee friendly spray regimes (no drift, night spraying), and plant strips of bee pasture along the margins of fields to feed bees, pollinators and increase the pollination of the field crop. 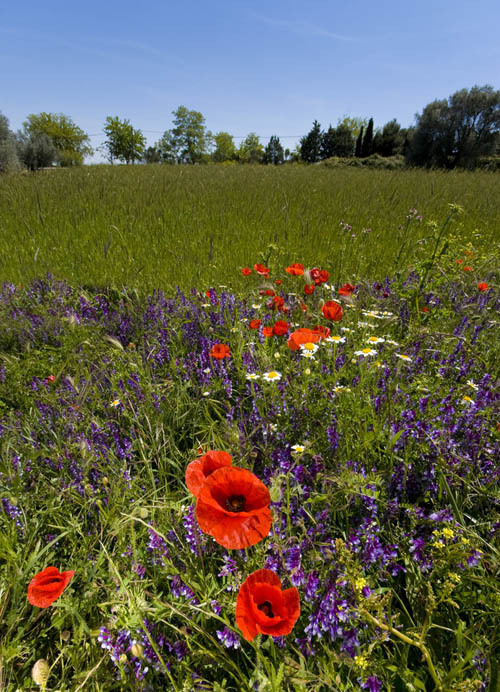 Municipalities can rework all plantings and unused lands to be bee and pollinator friendly. 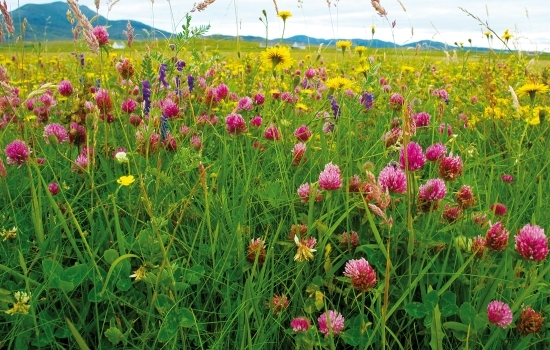 Every piece of fallow land should be planted over as a bee/pollinator pasture. And we need to go organic as consumers! bees need an attentive beekeeper to offer aid and assistance when disease and pests strike. There is no virtue in letting your bees die from neglect or a remediable condition. Beekeeper assistance includes making some effort to keep lines of bees that are resistant to local pressures ie. weather, pests and diseases. But in bee-dense (=high drift) areas and areas hosting prophylactically treated pollination hives, and areas awash in a yearly intake of non-local (in our case, New Zealand) genes, it is simply impossible and unrealistic (and, I think, cruel) to demand the bees develop to be “locally adapted”. In addition, we have an ethical duty to other beekeepers in our bees’ flight range to prevent disease and pests from our hives traveling to theirs. So bees need frequent inspection to minimize disease and pest issues…note that robbing screens may prevent drift into your hives of diseased or Varroa-laden bees looking for a new home. May that wonder always be your companion in the beeyard.